The Museum of the Shenandoah Valley (MSV) is excited to announce we are gearing up for tomorrow’s opening of Art and the Animal! The MSV is the final stop on the exhibition’s 2016–17 tour. For more about the exhibition’s display at the MSV, see the media release HERE. Art and the Animal will be on view in the MSV Changing Exhibitions Gallery from June 3 through September 3, 2017. We would love to have you visit as our guest and see the MSV installation of Art and the Animal. Please introduce yourself as one of the exhibition’s artists at the front desk and your admission to the MSV will be on the house. Just minutes from I-81 (901 Amherst St, Winchester, VA), the MSV includes galleries, seven acres of gardens, and the Glen Burnie House. The MSV is open Tuesday through Sunday from 10 a.m. until 5 p.m. On Wednesdays through August 30, extended summer hours until 8 p.m. are in effect (thanks to corporate underwriting MSV admission is free to all every Wednesday). We hope to see you at the MSV! 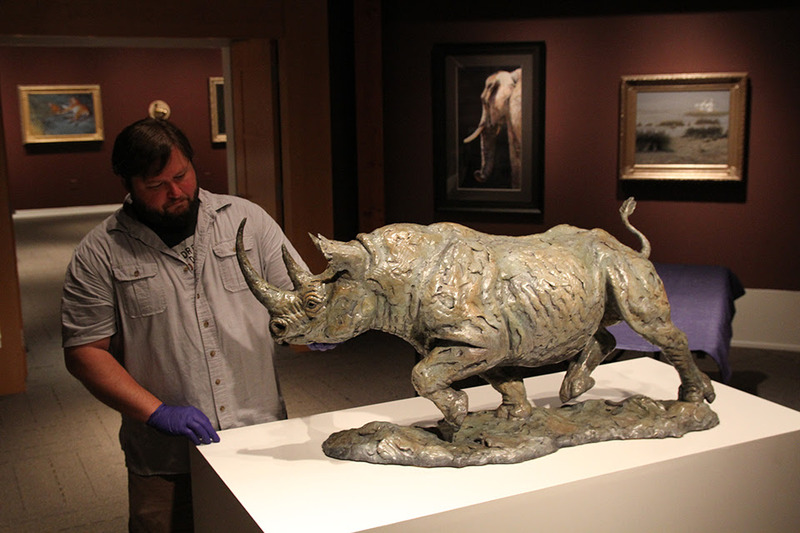 Above: MSV Director of Exhibitions Corwyn Garman installs Brute Force, a sculpture of an African black rhino by Mick Doellinger, SAA (Fort Worth, Texas). Photo by Rick Foster.